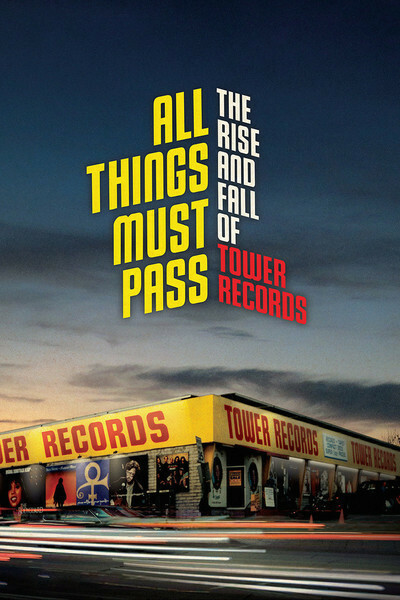 I had been eager to watch All Things Must Pass: The Rise and Fall of Tower Records since its “limited release” in March 2015. The run, however, must’ve been extremely limited. Because before I knew it, it was gone from New York City screens. And despite its ties to the A-list, being that Colin Hanks directed the film (the eldest child of 2-time Academy Award-winner Tom Hanks), the anticipation of a wider release was only just delivered this past April. It’s currently a part of cable network Showtime’s roster. Immediately sold on reveling in Tower’s heydays (you remember the chain, don’t you?) and learning about how its demise was partial to the rise of music’s digital market, I grasped that bequeathed to me would be a pop cultural take on American consumerism and the counterculture of the baby boomers. I am not a baby boomer. But by the time my generation commenced its childhood (Generation Y aka Generation X, Part Two), Tower Records was recognizable. The slightly slanted logo in red and yellow stood out. And equally as memorable were the racks on racks and shelves of compact discs that overflowed every location. I vividly recall the set-up of Tower on Boston’s Newbury Street. Five floors of every album, cassette, VHS, and music-related anything imaginable. I felt the excited (and overwhelmed) every time I stepped in. It was like an amusement park, but cooler. Instead of a sense of fear (because, roller coasters), inspiration was omnipresent. Next to museums and libraries, Tower was where dreamers were welcomed, unridiculed, and pushed to spawn their own ideas that refused to die. “The story of Tower Records is an all-too-familiar one — one frequently told about other once-thriving retail chains that have found themselves on the wrong side of history. It is much to the credit of Hanks and his collaborators that “All Things Must Pass” makes this particular iteration of the oft-told tale come across as freshly compelling, even poignant. Tower’s beginnings, like most great empires, were humble. Its founder Russ Solomon, a sociable grumpy cat, first sold records in the back of his father’s drugstore, Tower Drugs, in Sacramento, 1960. After becoming infatuated with the idea of selling nothing but music in a store of his own, the search began for spaces. 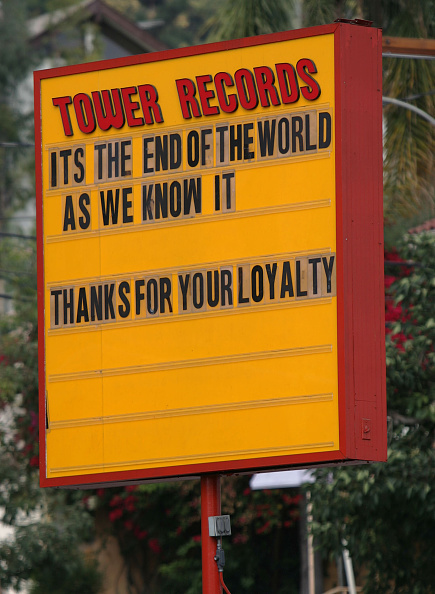 One of the first locations would be Solomon’s most iconic ’til the end, the Tower Records on West Hollywood’s Sunset Boulevard. The 1960s and ’70s would be a time frame of trial and error, but lots of unprecedented success for Tower. The best archival footage in the documentary were ’70s customers, including Elton John, sifting through bins of “Rock” to “Soul” and LPs price marked from $2.77 to $4.77. But alongside fun facts such as (what Rolling Stone magazine chose as the two greatest albums of all-time) Sgt. Peppers Lonely Hearts Club Band by The Beatles and Pet Sounds by The Beach Boys as Tower’s first big sellers. (And confirmation by early employees that the work environment was nothing short of a party). Occasionally, sexist commentary was expressed in All Things Must Pass. At first, Solomon had concerns about hiring women. Heidi Cotler earned the honor of being the bellwether of female employees in Tower’s boys’ only club. But the eventual bVP herself admitted to regularly holding her tongue to avoid coming across difficult. Cotler also recalled nearly going into labor behind the register, to further dissuade a sense of special treatment. A slight disconcertment was had in watching a White woman, who was a young adult in the ’70s, having felt psychologically chained to suppression in the presence of White men. I found Cotler’s seesaw starting point unforeseen and disappointing. And during one of Solomon’s confessionals, he referred to an outside business associate, that he disagreed with in a meeting, as an “idiot woman.” Clearly the hardships of being a woman in music do not begin or end on the stage as we, the public, so often perceive the unique experience to be confined in. It was also noticeable that much of representation of artists and genres in All Things were mainly driven by the classic rock of White men. Chuck D was the only notable face and artist of color to offer words. And no women aside from Cotler were shown speaking. Again, the angle of Towers’ history is largely that of the White male businessman and shopper. What is, however, likable about Tower’s rise is how Russ Solomon became a businessman. He didn’t finish school nor was he from a silver spoon upbringing. He learned from his father, an entrepreneur. Solomon simply yet surely took the necessary steps forward to make his store come true. Even when the prospect of opening his first outlet in Japan, in 1980, arose, Solomon and Tower management disclosed in All Things to not having a clue about international affairs. But the enthusiasm to give Japan a chance trumped concerns. Since 2006, it remains the only country in the world with remaining brick and mortar Towers. By 1982, the compact disc had arrived just in time for future blockbuster albums from Prince, Madonna, Lionel Richie and Bruce Springsteen (as they were all namechecked). The CD was admired for being smaller, units could be bought and sold for retailers exponentially, and seemingly, were less susceptible to scratches (vinyl is notoriously fragile). Some music insiders were privy to piracy as more accessible. But record stores weren’t thinking that far ahead. In actuality, stores and consumers had regulated the vinyl as “old” and “behind.” A stunning revelation thirty-four years later. Forbes reported last month that in 2015, vinyl had reached a peak of $416 million in sales, up 32% since 1988. (CDs decreased by 17%). By the ’90s, Tower Records was an institution. Bands like Pearl Jam held mini concerts inside stores and the Use Your Illusion double disc by Guns N Roses were the albums they dreamt of. I bought my first album, with allowance, from Tower in 1996 and it was the Spice Girls‘ Spice. 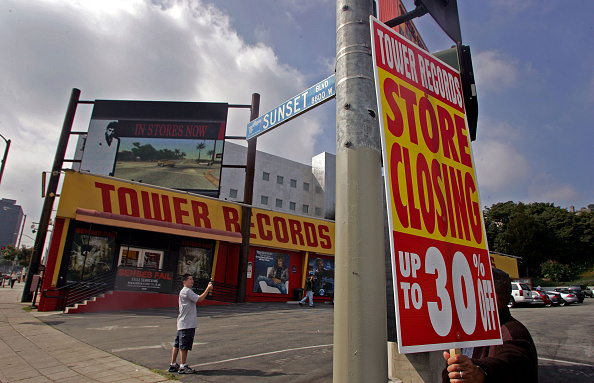 But in the 2000s, Tower Records had overextended itself in locations and succumbed to corporate greed. Changes such as the obsoletion of the CD single also occurred forcing music buyers to purchase whole albums. And album prices rose by a lot at most record stores. Tower attempted to appear invincible against the noise of overcharging and the attractive world of free music at your fingertips, thanks to Napster and Limewire.Yet Napster’s groundbreaking presence was the beginning of the end. The value of music faltered in the public eye began being treated as some kind of comp. In 2001, the music industry was revolutionized with the birth of the iPod. The former staff of Tower Records maturely chose cordiality over ego when discussing the rise of downloading music in All Things. Still, convictions were taut in that buying, owning, and treasuring music as actual entities would again prevail. During a 2007 guerrilla video interview, that is still up on YouTube, Solomon predicted the return of the physical library. Re-living the demise was when the documentary got tender. Tower Records were the doyen of record-buying. Under their reign stood other retailers such as HMV, Strawberries, Sam Goody (since 1950) and the Virgin Megastore (which would come to replace Tower locations until they too shuttered). As well as independent shops such as Boston’s Newbury Comics, and for cities like New York and Chicago, the now gone Bleecker Bob’s and Coconuts. (Earlier this month, after 21 years, Manhattan’s Other Music announced it was closing for good on June 25). The record stores that remain today are relics of decades-connected good times, good music, simpler days, and actual human interaction. The announcement of Tower’s closing was sad in 2006. But ten years later, is a sobering realization of did the Internet really kill the music (star)? My generation was the last to experience the thrill of going to a record store, covetously obtaining the music you wanted (and paid for), and sometimes before even getting home, opening the compact and reading the booklet like it contained clues. One of the last albums I did this with zest was The Kills‘ 2008 release Midnight Boom. And I was one of many who worked at Tower Records at one point. The distinction being that I was a temp hire for its last three months in Harvard Square. Today, it is a Verizon store. All Things Must Pass is a film (seven years in the making) that tributes an era of music that hasn’t entirely diminished but certainly dwindled. How funny is it that vinyl is enjoying a retro resurgence as you read this? In referring back to Leydon’s observation that Tower Records was one of many brands that lost itself in history. Thanks to All Things, its legacy is illuminated and in smoothing the bumps, deservedly remembered.